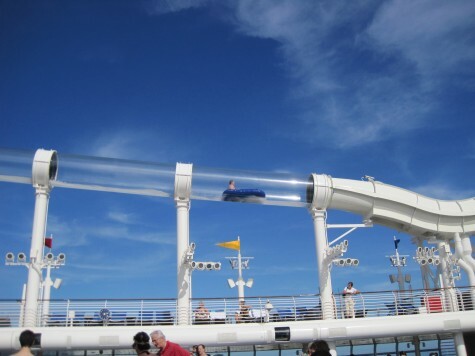 Today’s post will be about AquaDuck, a 765-foot water slide that will only be found on the Disney Dream and Disney Fantasy (when the Fantasy is commissioned later this month). 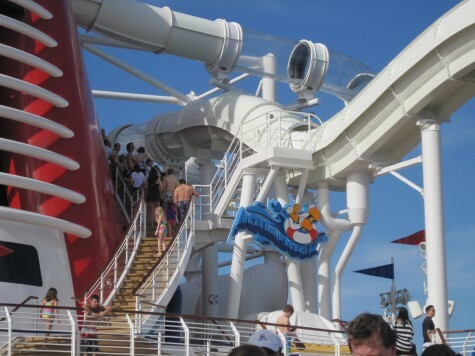 They’re the only cruise ships in the world with complete water slides on board. I had to wait until my waterproof camera pictures were developed to do this one and I’m so excited about it! AquaDuck starts inside the rear funnel and travels from the stern of the ship towards the bow, then goes under the bow funnel (behind the Funnel Vision screen) and then continues back toward the stern of the ship again, depositing you right at the bottom of the stairs so you can hop right back in line! 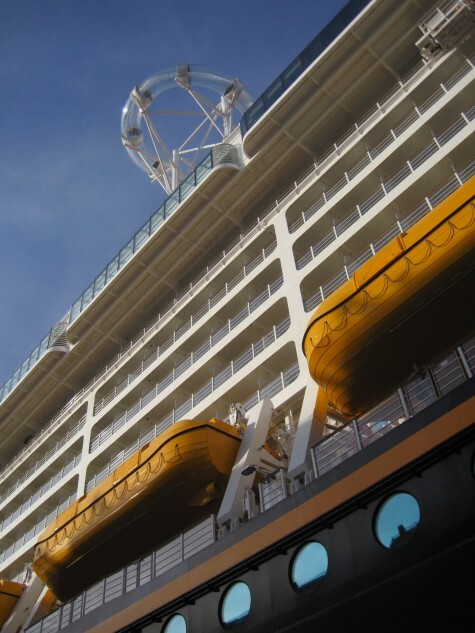 The view of AquaDuck from the docks in Nassau. Guests get to enjoy a great view of the pool deck while riding. There’s an adorable comic strip to read while waiting for AquaDuck — strangely, though, you have to read it from right to left. 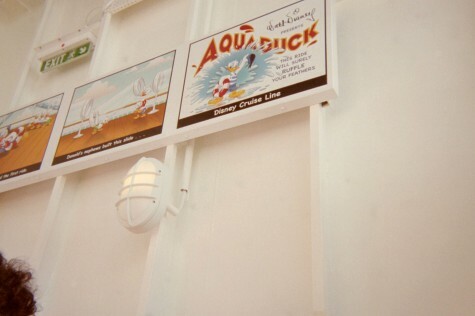 This was taken with a waterproof film camera and the viewfinder was tough to navigate. The rest of the comic. 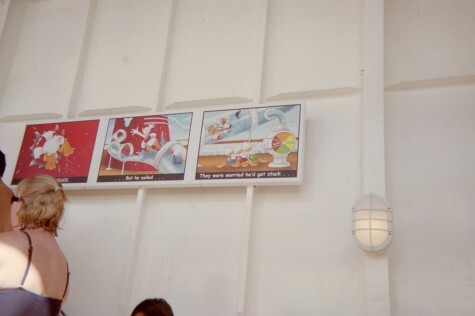 Which shows Donald overdoing things on the ride and smashing into the fore funnel. Ha ha! And there’s Donald in the funnel! Yikes! 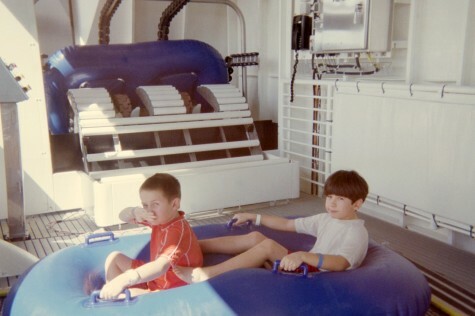 There’s a conveyor that brought the rafts from the end of the ride straight up to the top. I also liked that my boys are old enough and tall enough (over 48″) to ride it together without an adult on board. 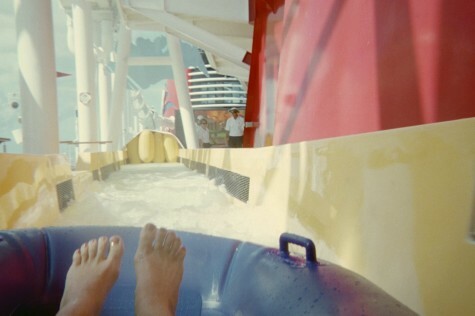 I took a waterproof camera with me to get some pictures of the ride itself, such as the trip through the forward funnel, but the ride was so exciting I forgot I had the camera with me till the very end. 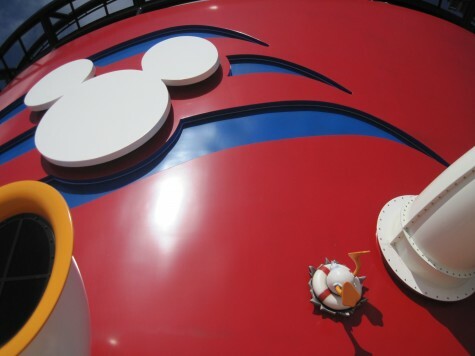 I got this picture below, but then found out that due to safety concerns, no cameras are allowed on the ride. WHEE! It was a wild ride down to the base of the attraction, where that cast member to the right asked me to not take cameras on the ride in the future. Oops!